Installation day: Fr Adam Woch (second from left), on the day of his installation as St George-Dirranbandi parish priest, is with (from left) Fr Jamie Collins, Bishop Robert McGuckin, Fr Jim Cronin and seminarian Thomas Duncan. FR Adam Woch had thoughts of being a missionary in Brazil when he was ordained in Poland, and ending up in outback Queensland would’ve been beyond his wildest dreams. Now, as parish priest of St George-Dirranbandi, he could not be happier but the experience is nothing like he could have imagined. “For me, it’s a new experience,” he said. Fr Woch said the differences between his new patch – the Balonne Shire – and his home province of Lublin in east Poland were stark. “This parish, covering the Balonne Shire, is even bigger than my province,” he said, thinking of the vast area he has to cover. “This parish, or shire, is over 31,000 square kilometres. “My province is 25,000 square kilometres. “The population there is around two million people, and there are around 5000 people here (in this shire). But Fr Woch is used to adapting; only a few years after being ordained in Poland in 2000 he volunteered for a posting in the Southern Highlands of Papua New Guinea and stayed for more than 10 years. His bishop had a chance meeting with a bishop from Mendi diocese in PNG when they were both visiting Rome at the same time, and the PNG bishop mentioned the problems he was facing because of having so few priests. That was at a time when Fr Woch had been thinking seriously about missionary work in Brazil. A year after being ordained he had been assigned to complete doctoral studies in sociology. About the time of finishing his studies and contemplating his ideas for Brazil, he read a letter published in his diocese informing the priests of the opportunity in PNG. “No one volunteered to go to PNG, so I did,” he said. He was sent to a mission centre in Warsaw and then to England for six months to learn English. “In PNG, I spoke mainly Pidgin English,” he said. At the end of more than 10 years in PNG Fr Woch was about to return to Poland when his life took another change of direction. 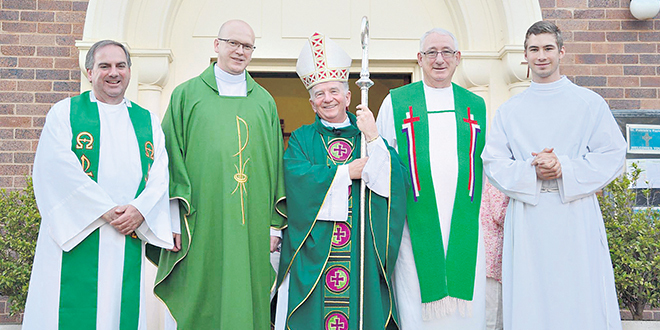 “Fr James Byrne, a friend of my late archbishop, invited me to come to visit (in Toowoomba),” he said. During his visit he met Bishop Robert McGuckin and learned about the diocese’s need of priests. They talked about the possibility of Fr Woch coming to Toowoomba diocese instead of returning to Poland, and his archbishop eventually agreed. He has been in the diocese since February, and he arrived in St George at the end of that month. One of the highlights so far was his recent installation as parish priest by Bishop McGuckin at St Patrick’s Church in St George. But he is happy and content with life in general. “This area, especially St George is a nice town – the small town is beautiful, located by the (Balonne) river,” he said. “It’s not just about what we can see but the people from the countryside. “The people from this area, I’ve never met in my life such generous and faithful people. “The people are really friendly. “They are honest. They are able to tell me what they like and what they don’t like. Fr Woch said they were pleased to have Bishop McGuckin visiting for his installation on a weekend that coincided with the parish-school fete. The parish took the opportunity to give special recognition to parishioners John Barrett and John Lyons for the service they had given the parish over many years.